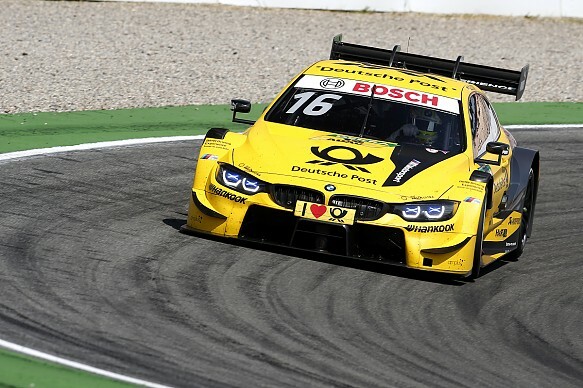 Timo Glock snatched pole position for the final DTM race at Hockenheim aboard his BMW, narrowly beating the impressive Audi driver Rene Rast. Audi continued to struggle at Hockenheim, which it has put down to a combination of oversteer and the loss of downforce caused by the new rule packages. That made Rast's lap of 1m32.587s in the first flying runs all the more impressive, with Mercedes' Dani Juncadella almost three tenths back in second. But when the final attempts at pole took place in the remaining minutes, it was Glock who stormed to the top with a lap of 1m32.379s. The former Formula 1 driver's pole lap was over two-tenths slower than Paffet's benchmark in first qualifying on Saturday. Rast had to settle for second, one of only two Audis in the top 10, but came under threat from the highly impressive Joel Eriksson. The 2017 European Formula 3 championship runner-up set his best lap in the final seconds to go third with a time just 0.026s slower than Rast. Mercedes locked out positions four to sixth, with Edoardo Mortara's late lap enough to depose stablemate Lucas Auer to fifth. Paul Di Resta also improved late on and took sixth ahead of Juncadella. BMW's Marco Wittmann was ninth ahead of the second-best Audi of Mike Rockenfeller. Saturday's race winner Paffett qualified 10th ahead of Pascal Wehrlein. Audi took four of the bottom five positions with Robin Frijns in 15th ahead of Nico Muller, having taken a trip through the gravel in the third practice session. Jamie Green was second in the previous session but could only secure 17th in another difficult qualifying session. Mattias Ekstrom qualified 19th and last for his final DTM race this afternoon after he was unable to start the second flying run due to a problem fitting tyres to the right-hand side of his Audi.